If you have been told that milk is not a healthy food for you and your family to consume, Know that history stands firm as a strong and convincing counterpoint to this false modern narrative. Milk and milk products are the single best source of calcium. Calcium is one of the most essential minerals in our bodies. It promotes the formation of strong bones and healthy teeth in children, and helps older people avoid osteoporosis. When combined with Vitamin B12, it helps to lower high blood pressure. It has been shown to lower blood lipid levels and significantly reduce the level LDL (bad) cholesterol. In addition to helping maintain a healthy immune system, studies show that a total daily intake of 1,200 mg of calcium can reduce the risk of colon cancer by as much as 30%. Milk contains the essential proteins that we all need to stay healthy. Protein builds muscle and connective tissue, helps maintain our immune system, and contributes to the health of every organ and system in our bodies. One cup of yogurt provides nearly 20% of the recommended protein for the average adult male. Milk is an excellent source of Vitamins A, E and D. Milk’s natural sugars help the body to absorb calcium through the digestive tract. Milk from pasture fed cows contains as much as five times the level of conjugated linoleic acid (CLA), an antioxidant that helps prevent cancer, as cows that are not allowed to graze. Besides containing substantial amounts of protein, yogurt is also a great source of Riboflavin (B12), Phosphorus and Potassium. Ronnybrook yogurts contain live, active and probiotic cultures that strengthen the immune system and promote digestive health while improving the bio-availability of various vitamins, minerals and proteins. For those who are truly lactose intolerant, yogurt is a valuable source of calcium. 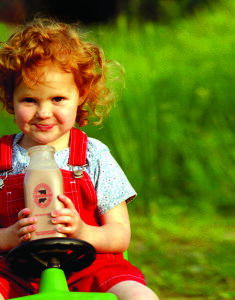 Studies show that the regular consumption of dairy products lowers the risk of obesity. Nearly 15% of our kids are overweight. A Boston University study found that just two servings of dairy a day are linked to a substantial reduction in adolescent obesity. A study at the University of Tennessee concluded that milk and dairy products actually burn fat. The study found that women especially benefit from the consumption of low fat dairy products. Drinking lots of low fat dairy can reduce their risk of obesity by as much as 80%. Why is Ronnybrook Milk Better? Its fresh—we process the milk the same day that the cows are milked and deliver it within 48 hours. We are local—we are less than 90 miles for New York City’. You can come visit and see where your dairy products come from. Our cows spend as much time as Mother Nature allows grazing on lush green pasture. We do it all. 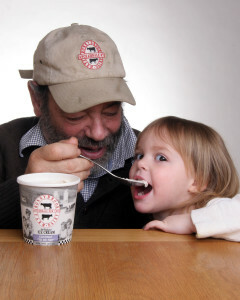 We raise our cows, we milk them and we process the various dairy products right on the farm. We pasteurize our milk at the lowest approved temperatures. MOST IMPORTANT-we don’t homogenize our creamline milk. Homogenized whole milk is not whole milk at all. It’s been pulverized and broken into micron size parts. Our creamline milk is delivered as the cow produces it. Not homogenized and with all the fat that the milk contained dircect from the cow. Often called Barista milk, the fat content can be higher than 4%. No artificial growth hormones (rBST). Our pledge to our customers and our cows: We have never used them and never will. The glass bottles don’t just look pretty. They can be re-used as many as two dozen times. They’re part of Ronnybrook’s commitment to recycling, sustainability and the smart use of our planet’s resources.